Meter 10mm Black Slide Binder Bars give your Documents a professionally bound appearance in seconds, without the need for a Binding Machine or Hole Punching. Slide Binding allows easy insertion and removal of pages as required. Also known as Slide Binders, Slide Binder Bars are a great way to cover stapled documents so that they look neater and won’t crush in the mail. 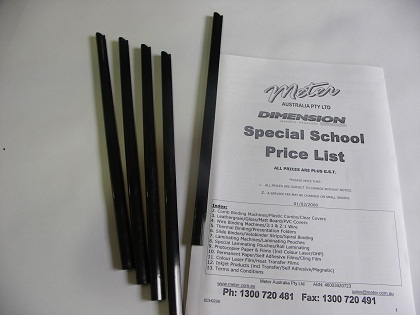 10mm Black Slide Binder Bars have a sheet capacity of 30 to 60 sheets of 80gsm paper and are A4 size. 10mm Black Slide Binder Bars are Environmentally Friendly. Due to Slide Binder Bars ease of use and the ability to remove from a document, they can be used over and over again. Unlike other forms of Binding Supplies that are discarded, 10mm Black Slide Binder Bars can be re-used on new presentations and booklets saving you time, money and resources.